Dayalu Baba is a sadhu who has been living at the base of a sacred mountain on the edge of Orissa’s Simlipal forest range for many decades. I first visited his simple ashram around 8 years ago. At the time he had a single mud hut, with a thatched straw roof, but there was a hole so big in the roof that he had more hole than roof. When it would rain his hut provided very little protection from the elements. 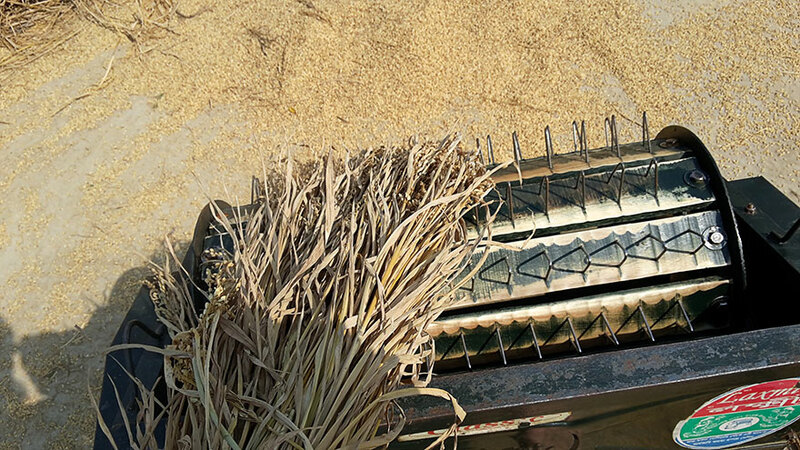 Usually straw roofs have to be changed every one or two years, or the straw begins to rot and fall apart. Being a very poor sadhu, and living in a remote area where no one would visit him, he didn’t have any means to repair his straw roof. 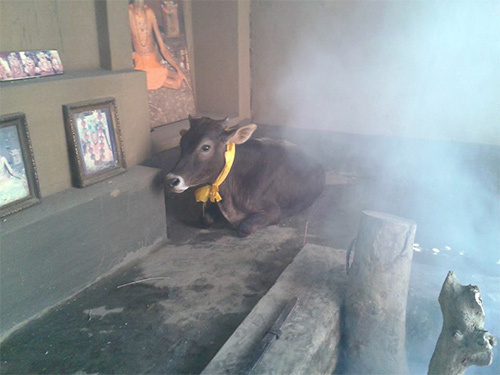 Despite the hardships, he had remained at that spot in the forest because it was a very powerful siddhi sthana, where many rishis had performed tapasya in previous yugas. Sages such as Vyasa, Narada, Buddha, and the Sapta Rishis, as well as avatars such as Lord Rama and Lakshmana had stayed at this location. After getting to know him I could understand that he was a very special soul, having done sadhana for decades at this spiritually powerful location. At first we tried to help him by repairing the roof of the mud hut that he was staying in. Despite helping, still we didn’t understand the full extent of the poverty that he and the other sadhus staying at his ashram were going through. I didn’t understand it till a later trip. One day we went to visit his ashram, and as is customary when visiting sadhus, we bought some simple sweets (rasagulas) in a shop to give to him. We arrived at his ashram around 2 pm and gave the sweets to him. Usually in most ashrams that we had visited, when we give the sweets the sadhus will put them on a plate, bring tea and distribute the sweets among the devotees present while drinking the tea. 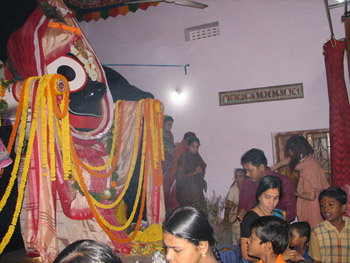 In this case Dayalu Baba kept the sweets to the side and only brought red tea (tea powder and water with no milk). We all drank the red tea, but in the back of my mind I was wondering why he had not distributed the sweets we had brought. We spent the day and night with him talking various topics, then it was time to sleep. From the time that we had taken the red tea in the afternoon till the night we observed that there was no other food that any of the sadhus at the ashram took. We were feeling hungry, but for us it was only one night so we tolerated it and went to sleep. The next morning we got up and were feeling hungry, but again we saw there was no food for the sadhus and no one was eating anything. The sadhus went about doing their morning pujas and meditation without any complaint. Finally around 11 am Dayalu Baba called us to come for breakfast. By this time it had been almost 24 hours since we had drunk the red tea the day before, and we were feeling really hungry. When we sat down, we saw him take out the simple milk sweets we had brought the day before, divide them amongst all of the sadhus present, and that was the breakfast – a few rasagulas each. Now we finally understood why he had not distributed the sweets the day before when we arrived. They had no food for the next day’s meal, so they were keeping the few sweets we had brought them for the next day. Sometimes we take things for granted. When we see sweets we think why aren’t we eating them, why aren’t they giving them to us. We can’t understand that there are people who don’t have food for the next day, and what we think to be a snack may actually be a full meal for them – or even their entire days food. From that experience I could finally understand the poverty of their ashram, and we began thinking how to help the sadhus so that they could become self-sufficient. 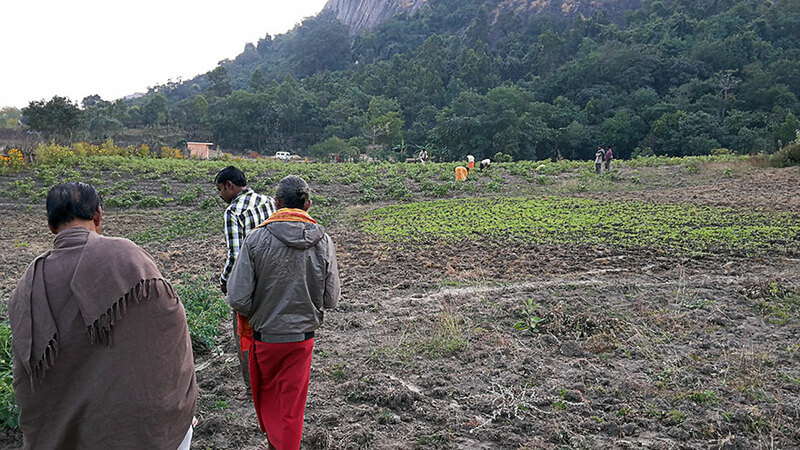 It took some time, but eventually we managed to buy two acres of farm land adjacent to their ashram and donated it to the sadhus so that they could grow their own food. 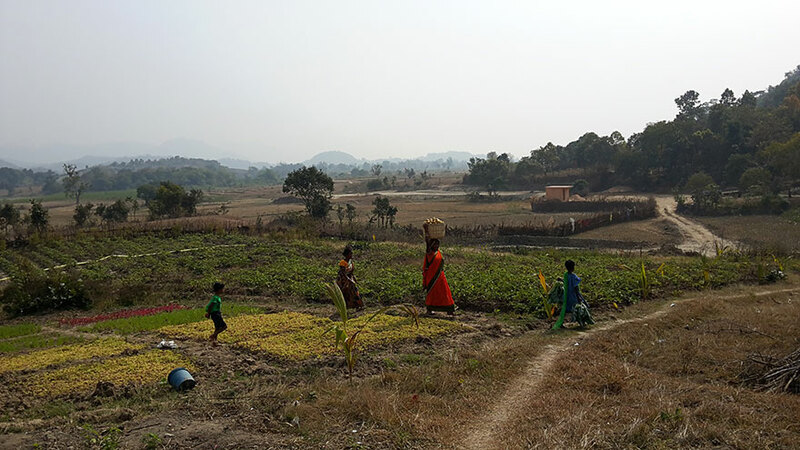 This is the second year that they have harvested the rice, and this year they have also grown some other vegetables as well as toor dahl. 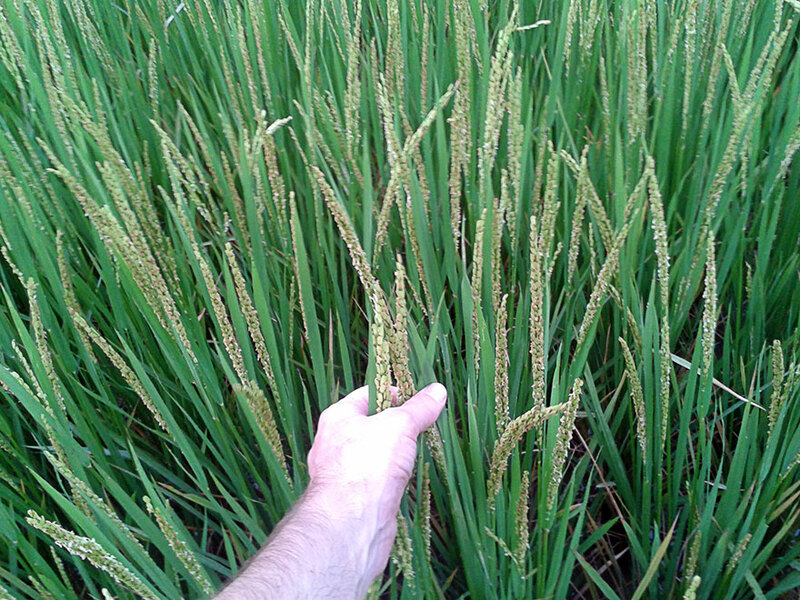 Below you can see some photos of the planting and harvesting of the rice and vegetables from this year. If you would like to visit and spend some time with sadhus at Dayalu Baba’s ashram please send us a message and we will try to help you. Staying is a bit austere, but associating with real sadhus is a great spiritual gift worth all of the effort and hardship. The ashram is located in the forest in the distance. 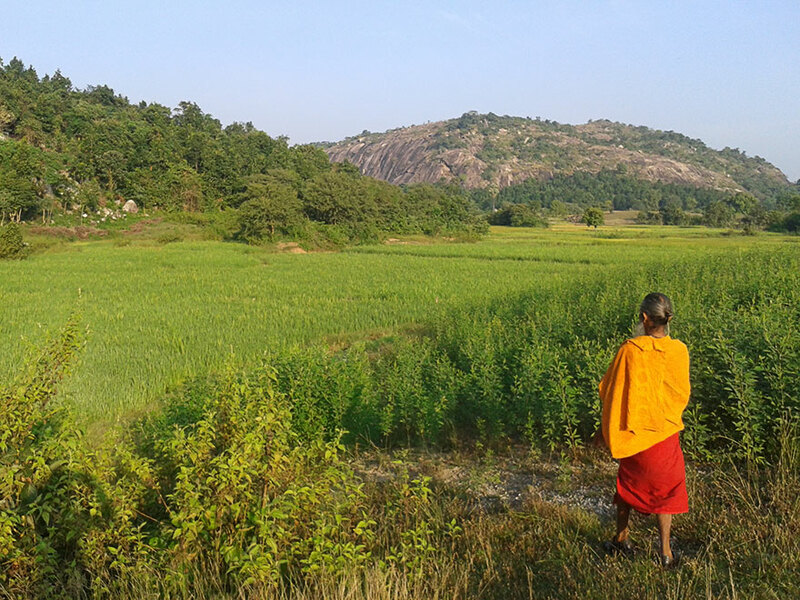 Dayalu Baba inspecting the ashram’s rice fields. 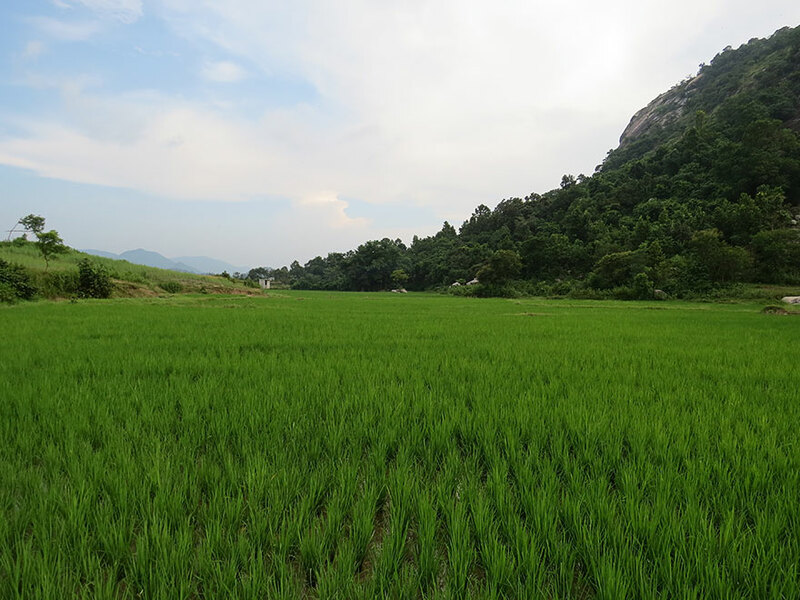 The ashram’s rice fields with newly planted rice. 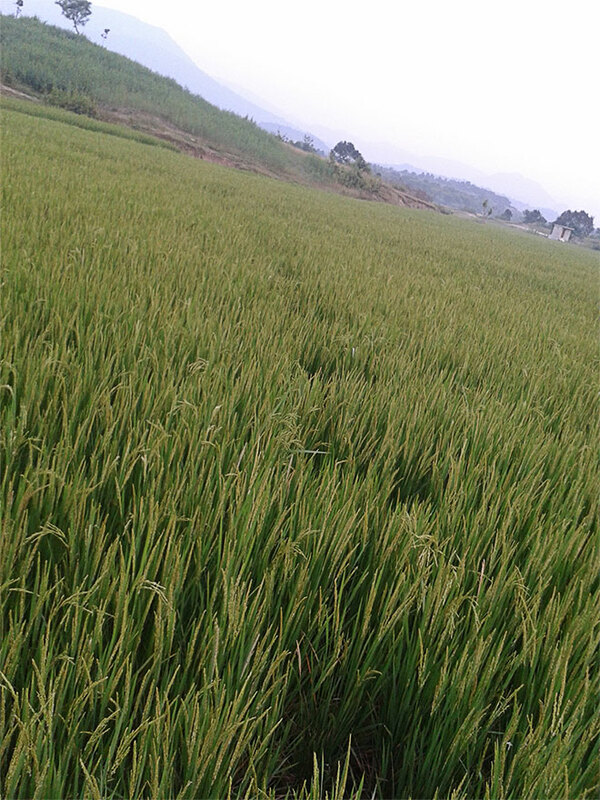 An elephant had walked through the ashram’s rice field. 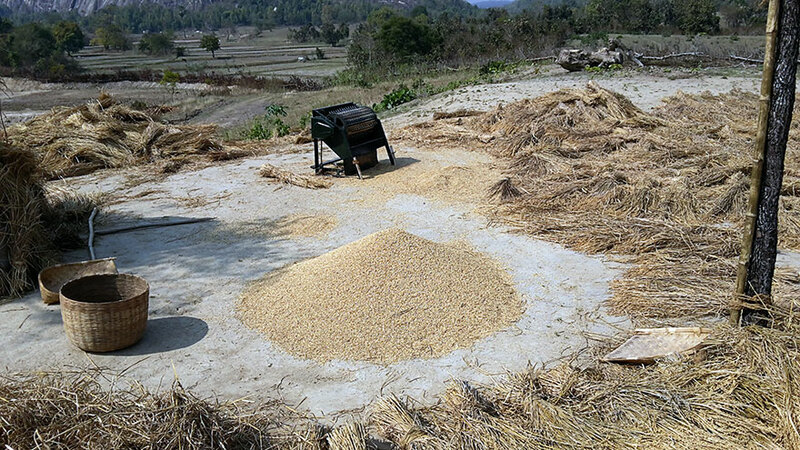 A pedal powered rice thresher. 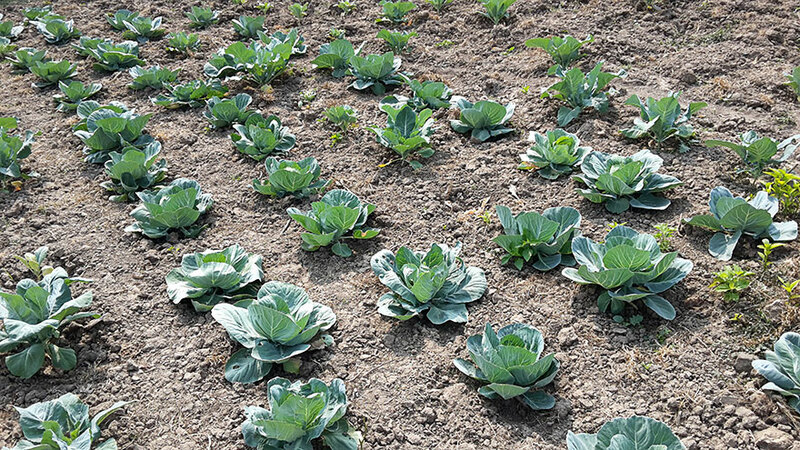 Growing cabbage in the ashram’s garden. 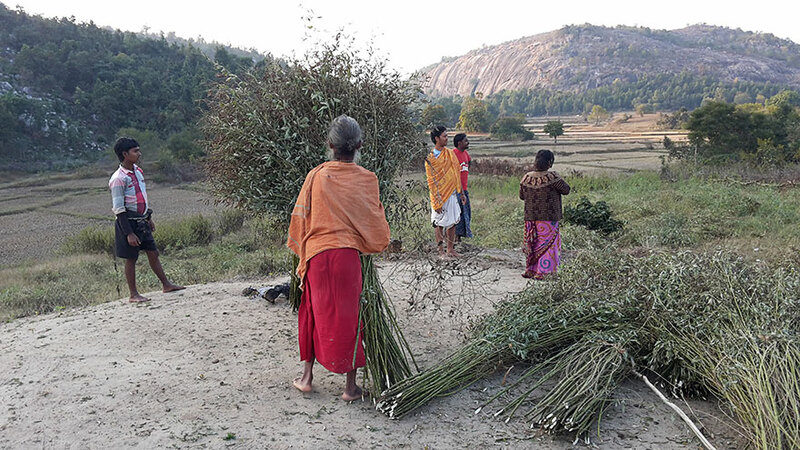 Harvesting toor dahl plants to dry in the sun. 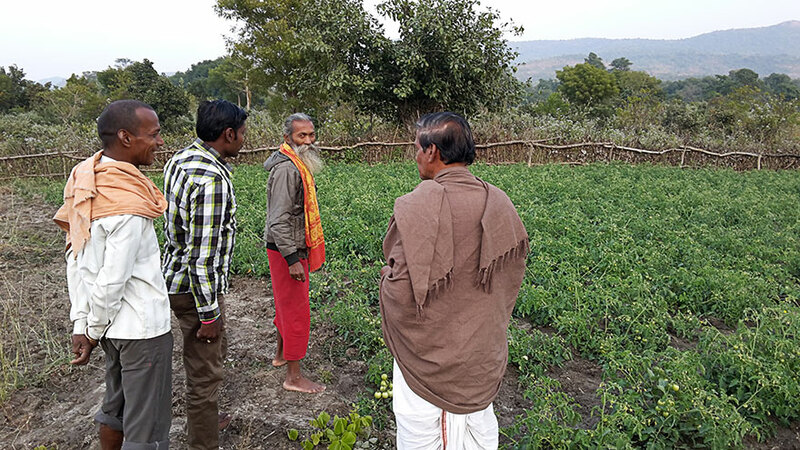 Dayalu Baba inspecting the tomato garden. 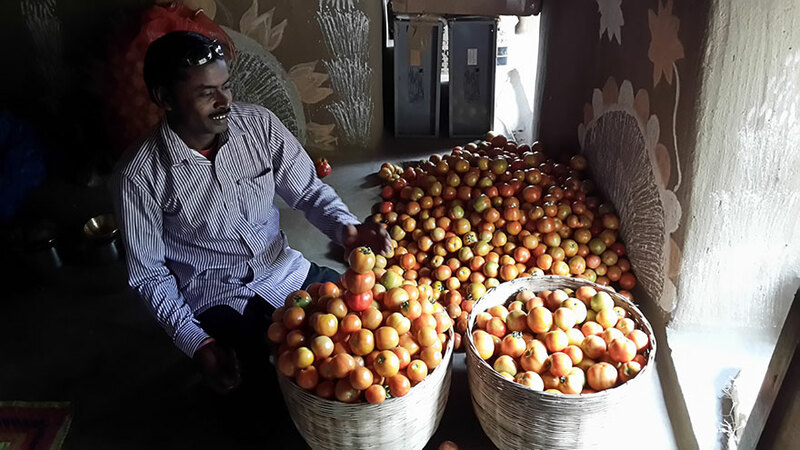 The daily tomato harvest during peak season. 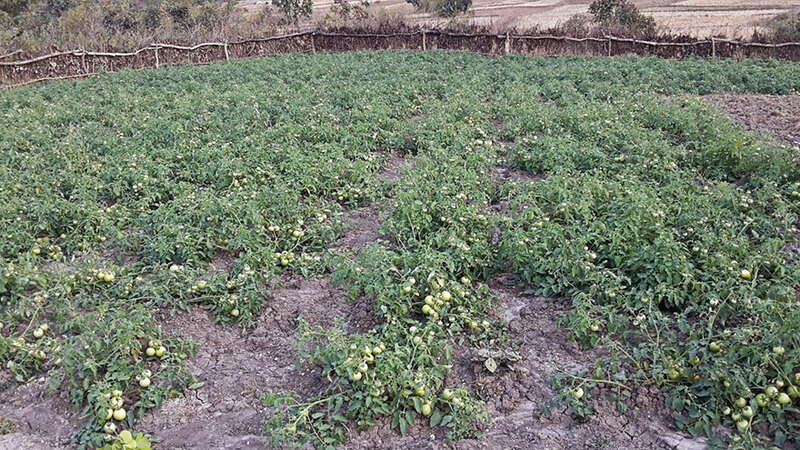 A view of the tomato garden at the ashram. 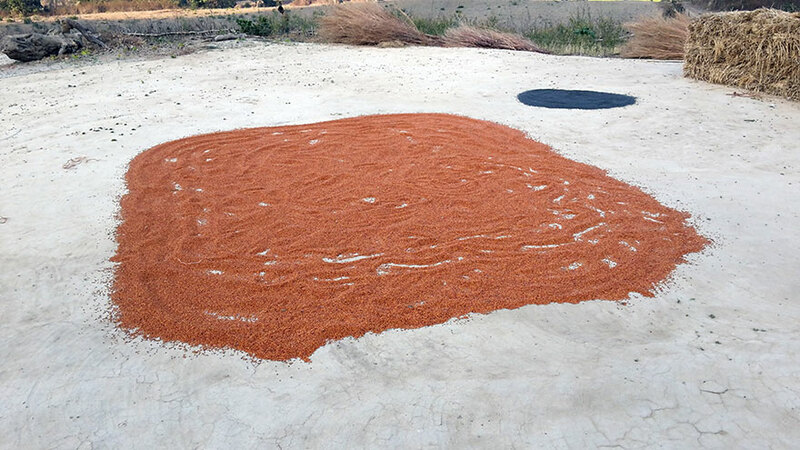 Drying toor dahl (red) in the sun along with mustard seeds (black). 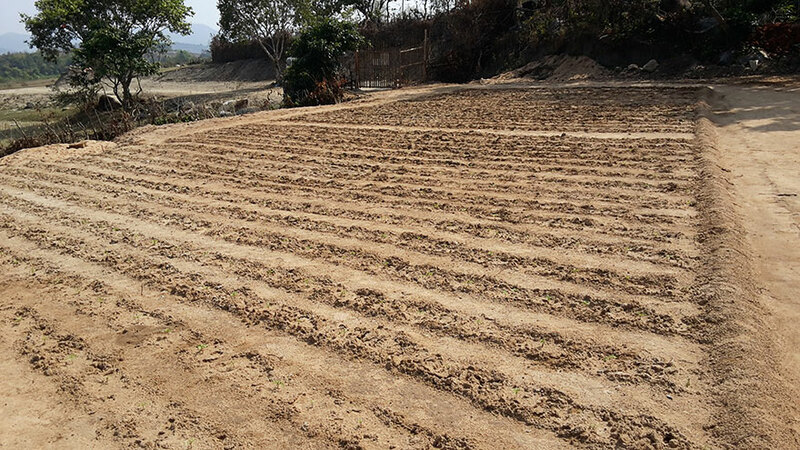 Preparing the garden for planting new seedlings. 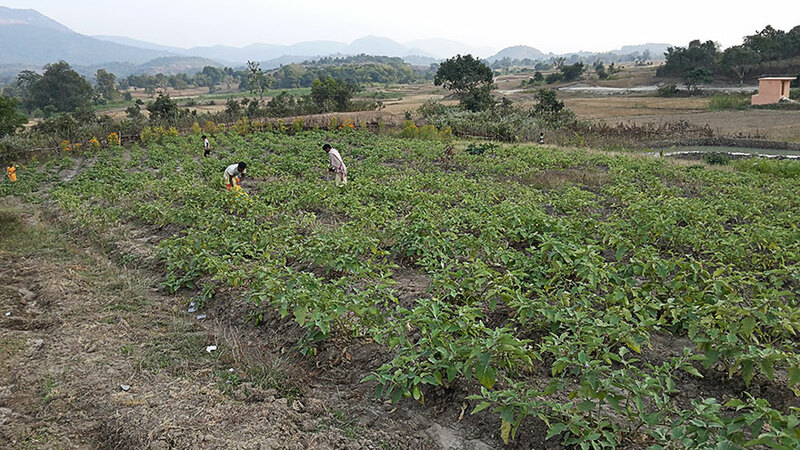 Devotees harvesting eggplants from the garden. Dayalu Baba walks through the ashram’s new vegetable garden. 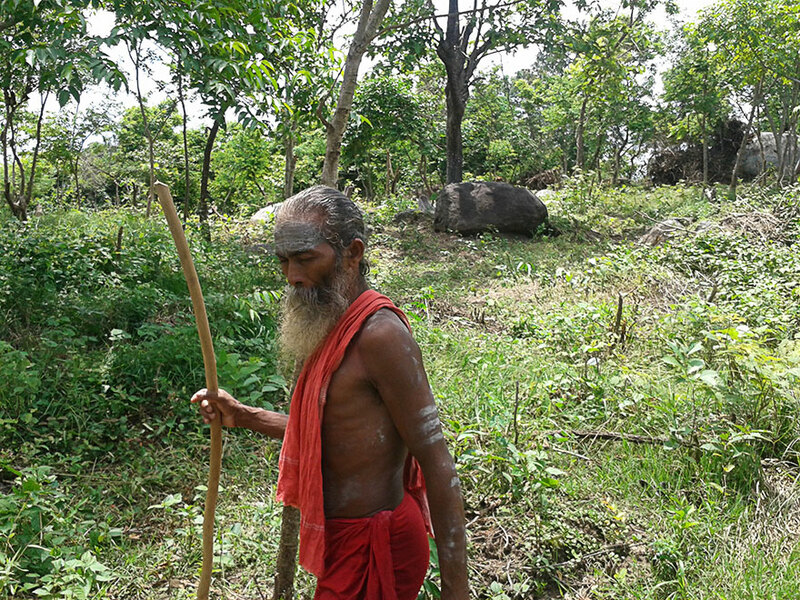 Dayalu Baba walking in the forest. I am please to receive this email and very sorry for the poor condition of the sadhus. I am also very grateful and impressed with the type of help your organisation is giving them. This is not only help for a few days but it is a long time solution. I am happy to know about Sri Dayalu Baba and your way of thinking. You have understood the situation and done what a sensitive heart could do. Acts like this give immense pleasure, because your efforts were put for a right cause and right people. awesome.In a way you people have done something good for that great Baba,but at the same time I feel you people brought him back to this mundane world,making him to cultivate the land to produce grains and vegetables.His time for meditation and tapas got disturbed.God bless you all. It is great service done for the sadhus. Someting could be thought abour for their shelter. KEEP GOING. This is real humanitarian work. Extremely noble & speaks of sustainability in the true sense of the word. Work like this do not get media attention ,since they all are busy covering events by which media can come to limelight with breaking news,breaking events, minor accidents of film stars & ignoring the cruel death of a child etc etc. Sadhus are also part of our larger indian populace and of the society we live in. 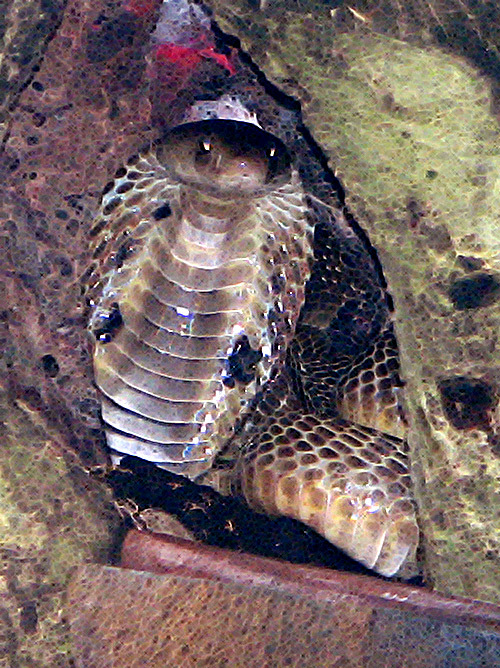 They may be recluse and also indifferent to the happenings of the world of today. However, food, dignity, shelter are all part of our basic human needs. Good that Bhaktivedanta Ashram is helping them. I saw a similar assitance given at Anand Ashram in Kanhanghad in Kerala for those wandering sanyasis to stay there for a few days, as they move around in their unchartered path of live….. Timely help , God bless u . It is a very good service ork done to Baba. 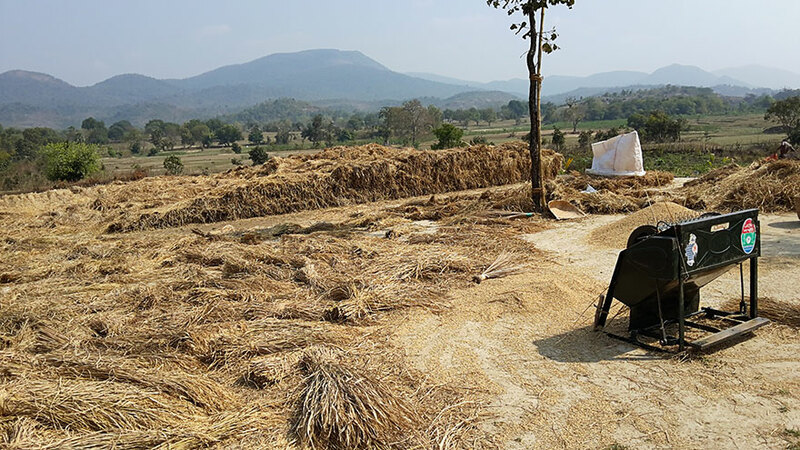 Similar efforts are needed in remote villages where people do not have much to eat. 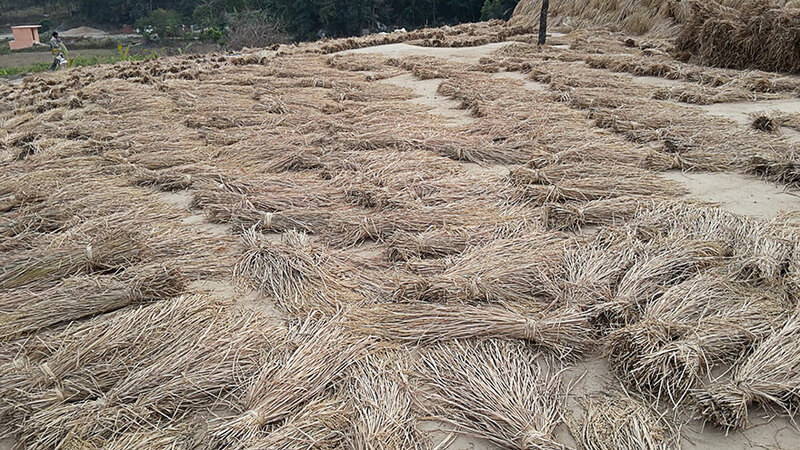 It is agricultural revolution needed for India. 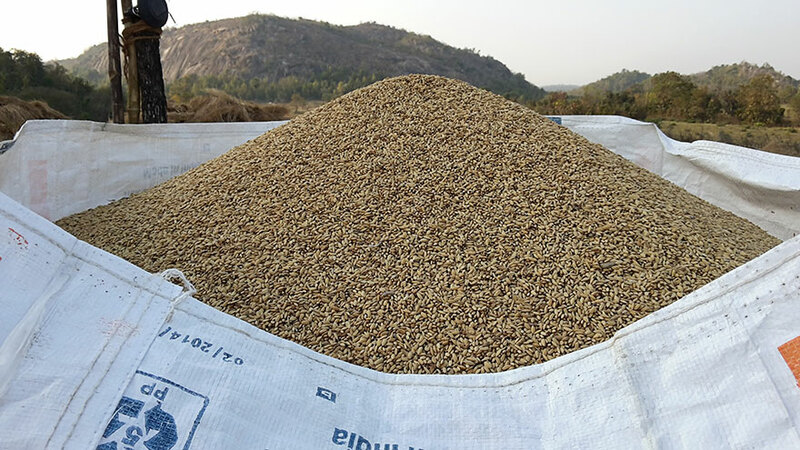 EDucated people earn money through white collar jobs and buy the agri products and they do not know the efforts involved. It is a good example to emulate. Hi , Truly amazing. One takes life for granted…. it is only when you are exposed to these realities that occur in other parts of the world ( especially our Mother Land ) you truly appreciate ones current situation. It is really a great help. I stay in Bhubaneswar, Odisha. It would be a great privilege for me if I get an opportunity to see the great soul. Please , let me know the details of Baba, so that I can try to go to the place. it is a very heartening and inspiring case. such sadhus must be identified and given proper care. it is our social responsibility. i would like to go to the ashram for two days. will you guide me ? thanks for creating awareness in a positive way. Sir, Good afternoon. Today afternoon read the article on Dayalu Baba’s Ashram and the conditions they were living in the densed forest of Orrisa. I am very much pleased to read that, as to how you understood their problems, and the solution to come out of it. Its simply amazing. 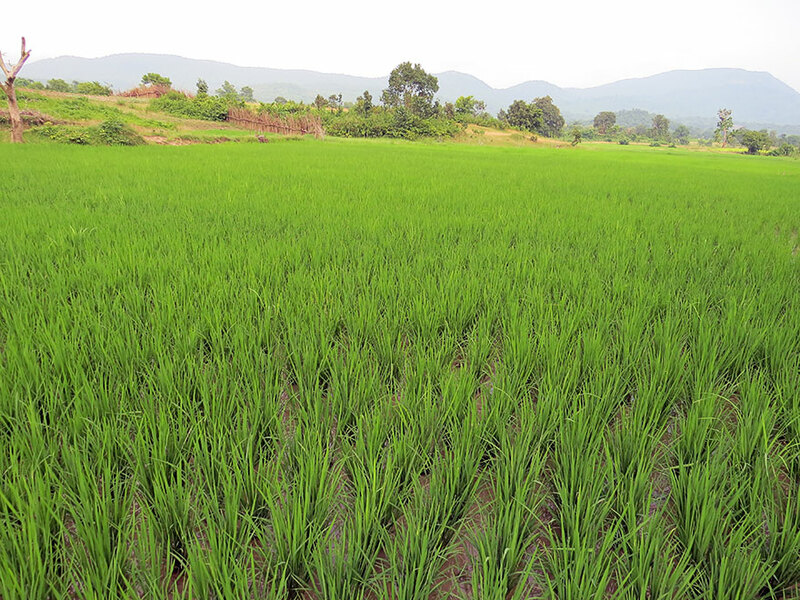 Due to your help and monetary assistance in buying a farm land of 2 acres for Dayalu Baba and made them self reliant. The sadhus in the ashram can now spend more time in meditation, etc. Thanks to you once again. Pl. let me know whether I can render some assistance in your noble job. Thanks. I am very happy to see, that helping people in this case he sadhus indeed a great service. We have to take more care for each others,because this is what we are. 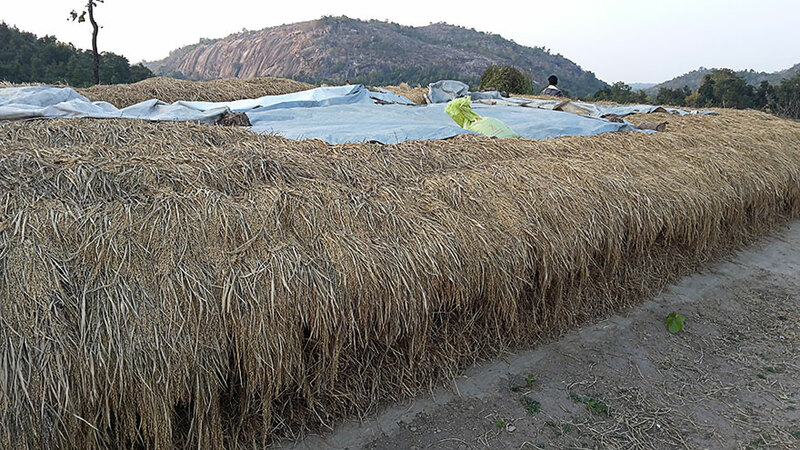 This is really a great thing doing cultivation of paddy at a remote corner of our country combating all odds one has to face during cultivation and yielding crops. This Sadhu is really great with firm determination proceeding in this line along with Tapas and Penance. Strange to know about the facts.Such is the state of great Hindu Knowledge banks (Sadhus) we all should think about the religious structure. Very very good thoughts. Instead of just giving money and comming back, you purchased a piece of agricultural land and showed them permanent solution for their living. Thankyou very much and bless you. If ever Nishkama Bhakti and True meaning of Tyag has to be understood then its only through Holy men like Dayalu baba and others equally great and more greater saints like him that we can know and understand and maybe follow a miniscule % . Well the true meaning of Renouncement and Sacrifice can only be understood at the Lotus feet of such Holy men . Have also had the good fortune of going through the views of some of my other friends whose views are listed herein above and got to say that for Jeevanyapan or Living a Life of austerity and piousness also Sadhus and their shishyas need food and so when they cultivate a little for themselves rather than being hungry and not knowing from where the next meal will come and getting distracted ( by way of hunger ) from pujas or Spiritual purifications which they perform its better that a little of their time is spent on cultivation and the resultant peaceful feeling ….. that ok we can go ahead with our Nityakarmas peacefully is of utmost importance for them in particular and maybe for others too for with their pujas they spread positive vibes far and wide .Genuine regards to those Spiritually inclined Souls who strived to make the baba and his shishyas comfortable . 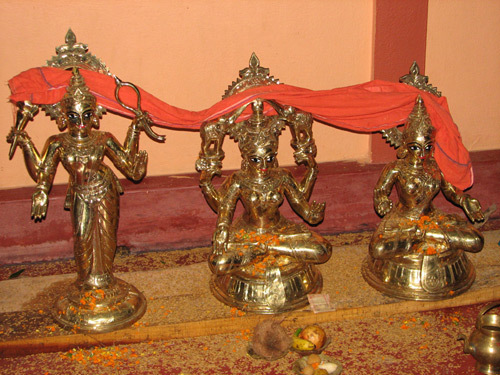 Jai Mata Di . Please tell me how I can volunteer. You have not given a fish to eat but you taught to do fishing so they no need to rely for the next day meal. Lord Shiva blessed you to serve. How can I send some donation. I am happy too to see our faith working in remotest part of India. Hopefully they don’t destroy the forest and nature surrounding for agricultural purpose. the next thing we can expect is more people visiting and nature is the likely victim. sir: wonderful. such sadhus are not ordinary. they are god’s gift to us. when we serve them we serve god direct. u are the most blessed person in this world. I am very much pleased to know about the facts, still they are living in a austere way. This is very holistic approach of changing the society. Every body should have a philanthropic gesture of doing good things to divine people. But there is chance of polluting the atmosphere by interefering ordinary people into the pious arena. 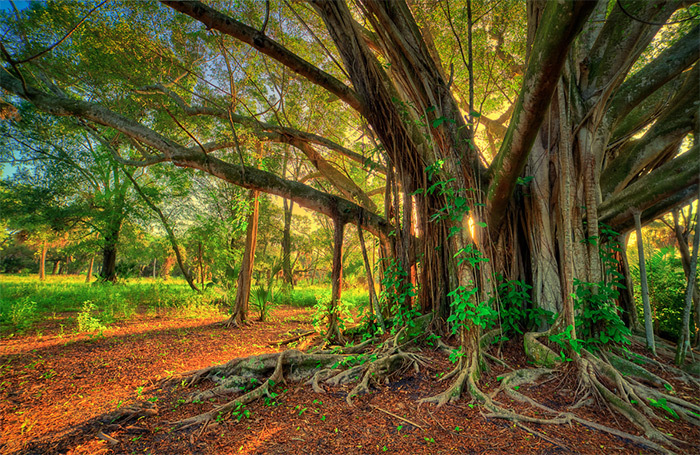 A simple, hardworking, self-sustaining life that is a far cry from the consumerism that is eating up this world. The world needs simple economies and not the destructive, monopolistic, mammoth economies which kill small economies and take the food away from the table, control what is to be eaten thus destroying indigenous culture, habits, food growing. It was really interesting for me to read. But the Sadhu who give all of its attention towards meditation now his attention diverted to grow rice and vegetables, I wonder how he mange both? I would like to visit the ashram and do volunteer service. Please give me details please. Kudos for the noble thought processes in buying the land and donating, that has now slowly inculcated into a self-sustenance belief in them, through your noble and timely contributions from all the like-minded. I would like to visit this place. If there is some plan from your organisation’s future visit, do keep me informed; else instructions to visit the place may please be emailed. I was very much impressed reading this article. Very good service Sir. You have done a great work. No words to explain further. When lot of fake sadhus are roaming around the country you have managed to find a genuine sadhu and his ashram and have helped them to have food on daily basis. Wonderful effort. I really appreciate the efforts of those “who made it possible”. I want to spend my summer vacations along with my family at Baba’s ashram . Please tell how we can approach them. It is humbling to see our nation still remember our responsibilities toward sages. Irrespective of having to race to make monies to make the sustaining minimum amount of money to survive in day to day life, there are still people so considerate and loving that they find time and serve sincere noble sadhus in recluse. May more of us learn from them and choose a life of simplicity and prayers to live out the ephemeral existence. My sincere pranams to the Lord in those noble people who do this selflessly. Great work, please keep it up. It is a great work done thinking in terms of their future which will help them life long. GOD Bless you all. Really its great encouragement to Sadhus for a peaceful and happy living, mainly for self-sustainability. Really Sadhus wants to share with every one who ever visits their Ashram. In rural areas, we should have Go Seva, Sadhu Seva and other needy people – through Waste land development we can get lot of resources for self-sustainability. Wherever Good Sadhus will be there – there will be peace and prosperity – let us encourage such movements. Efforts are appreciated and would like to visit and spend some time and want to be a helping hand ,please let me know the details. Practising such rigorous austerities and living in such utter poverty by Sadhus in the forest in today is really the rarest in the world. May this ashram and their piety open the divine light in our materialistic and selfish minds! Very heart warming indeed to know the timely assistance rendered to the Sathus. Service to man is service to God. Jai Sairam. where is the baba’s ashram place and we can visit there. 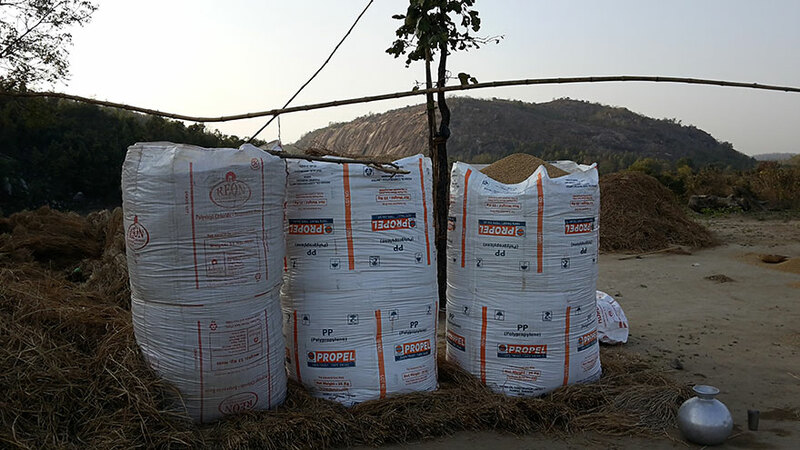 all crops growing fertilizers or (sendriya khat) natural fertilizer. crops and vegitables are selling in market. your upkram is best we appreciates your efforts. My sincere obeisances and pranams to those pious sadhus. VERY NICE ACTIVITY U PEOPLE ARE DOING. how i can reach there please send a complete addresss of Dayalu Baba.Thanks. They are living in such poverty , so sad and heart breaking ….but they have not lost their faith. May they for ever be blessed with food planted by their own hands, so they may never go hungry again. I would like to visit the ashram and Help. Could you mail me the Address and any Contact number to reachout to you. This service rendered is a service to the Self in all. My humble pranams and prostrations to all concerned. The name itself says alot. Keep up the feeding the last one in the society. Food is essential for sadhus to maintain themselves so that they can give grace to others otherwise they will have to leave their bodies,so great sewa,you are great,want to assist you and the baba .I am a kargil war veteran,advocate, social worker. Led two successful attacks in kargil war. I am working at Keonjhar district. Swamiji could u give me the location details of dayalu baba so that i can spare some time with baba. 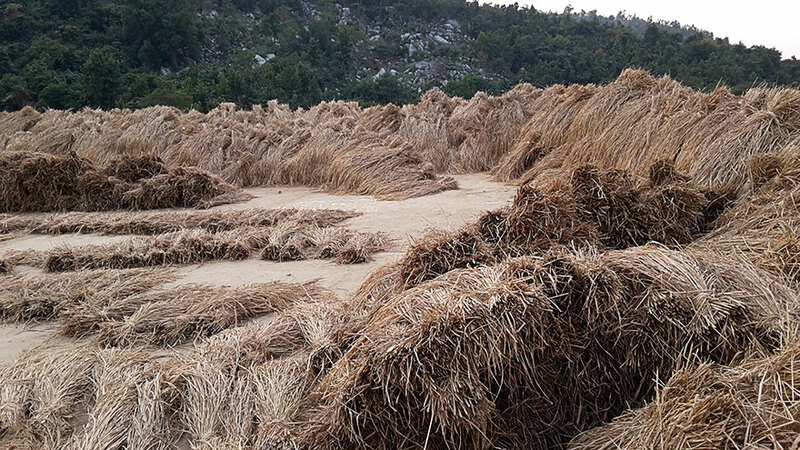 Bhagawan has inspired you to this Divine work, and by your example we all feel urged to contribute in some way or other. The true Sadhus must be looked after by society. Your efforts in this regard are really commendable. The Sadhu Dayalu Baba is a true man of renunciation. Such spiritual souls are the guardian-angels of our heritage and culture. Great sewa! Very happy to read the article. I AM PLEASED TO KNOW YOUR SACRIFICE TOWARDS THE DAYALU BABAR ASHRAM, AND IT IS WISE TO SPENT SOME MOVEMENTS WITH THESE POSITIVE ENERGY HOLDER(SADU AND SAINT). LET ME SEE,IT IS HIS WISH——FOR ME TO VISIT HIM. It is a wonderful experience. Looks good location for Vanaprastha asrama. May Baba’s seva of Sadhus go unhindered. Very good service. The volunteers and contributors can be grouped for any service works the ashram requires as a team and in the needed hours. What you people have done for Dayalu Baba’s Ashram to make it self sufficient, is the best that can be done. It is the true Sadhu Seba. Intermittent help in terms of money can’t match it. The timely and judicious action taken by all of you is highly commendable. No words can be sufficient to appreciate this heart-felt help rendered.